QCW fiber laser cutting of a 10 mm thick carbon steel automotive component using the latest Prima Power Laserdyne process for piercing and cutting. Changeover dwell time between two assist gases was reduced to zero adding up to hours of time savings per day when multiplied by hundreds of cut features required in multiple automotive components. Combining advanced laser control, new assist gas hardware, and non-contact part mapping now allows users to significantly reduce the cycle time for cutting 3D parts produced from high strength low alloy (HSLA) plate. By shortening the time for piercing of 5-10 mm thick steel plate in parts containing several hundred holes, slots, and other shapes, the cycle time has been reduced over 30 percent compared to traditional laser processes. 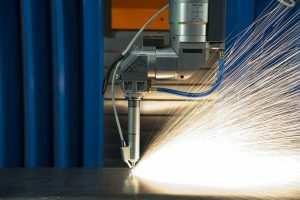 Fiber lasers with average power of 2000 W have been commercially available for over 10 years with widespread use by automotive component manufacturers. 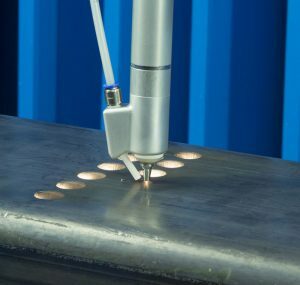 The majority of fiber lasers produced in this power range have continuous wave (CW) output and are well suited for automotive metal cutting and welding applications. Until now. Quasi continuous wave lasers (QCW) produce peak power 10 times greater in pulsed mode than CW mode providing new process opportunities in automotive and many other industries. Major QCW laser enhancements in process speed and quality have been made recently in both aerospace and medical device manufacturing. These are now being adopted in other industries particularly in the automotive sector. The improvements have progressed rapidly at Prima Power Laserdyne, which is fast becoming the leading innovator of this activity. 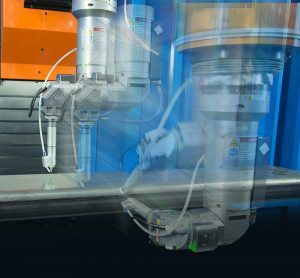 SmartTechniques is a suite of hardware, software, and control capabilities that improve productivity and quality in laser processing. 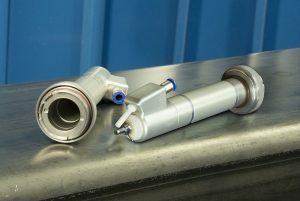 The process described in this article incorporates two of the Smart Techniques – SmartPierce™ and SmartSense™ – along with a unique, patent pending gas assist nozzle that achieves the stated goals. Originally developed for aerospace applications, SmartTechniques are now being adapted to meet the needs of the automotive industry. Automotive applications typically differ from aerospace applications in a few important ways. The major difference is the type of the material that is laser processed. Generally, aerospace parts are produced from stainless steel, nickel based super alloys, and titanium alloys. These parts usually require high tolerances and strict control of metallurgical properties such as the heat affected zone and the recast layer thickness. In addition, aerospace parts usually require very lengthy processes. For example, laser processing an aerospace combustor requires drilling thousands, sometimes tens of thousands, of cooling holes in a single part. Required hole feature size and location is measured in thousandths of an inch (fractions of millimeters) needed to provide precise airflow over the surface of the combustor. In contrast, automotive parts are generally fabricated from cold or hot rolled steel. Cutting speed and throughput are the most critical requirements because of the quantities of the components required. While automotive parts also require quality and precision, they are more often secondary to processing speed. Edge quality and feature size of many automotive components do not have the same impact on the performance of the component as they do for aerospace components. On the other hand, cycle time often determines process viability for automotive components. For laser processing to be acceptable in this automotive application, the component manufacturer established aggressive goals for 5-10 mm thick sections of low carbon steel for cut quality, cycle time, component quality and operating cost. The cut quality required rapid pierce without any spatter. Cuts had to be dross free with minimum taper. Features such as slots and holes were to be located within the required precision, despite the fact that the formed blanks could vary significantly from the design shape. Part-to-part cycle time was the key goal while minimizing cost of optics, assist gasses and other utilities. Prima Power Laserdyne’s piercing process using compressed air shortened pierce time to just 0.4 seconds in 7.5 mm thick carbon steel while eliminating undesirable spatter. Laser cutting of thick section carbon steel traditionally is a gas-assisted process using either oxygen or an inert gas such as nitrogen. Variables related to the assist gas have a big influence on the cut quality. These include assist gas pressure, nozzle design and standoff. All play an important role in governing the gas dynamics while significantly influencing the cut quality and cycle time. One of the benefits of using an oxygen assist gas compared to air for these automotive applications is the ability to clear the cut of molten material and produce a dross-free cut. The pressure of the gas is important. Too little pressure and the molten material may adhere to the parent material forming dross and at times seal and ruin the cut. Conversely, too much oxygen can burn and significantly degrade the cut quality. To avoid failures in these applications, oxygen assist gas is preferred to achieve a clean cut. Most important, oxygen assist gas helps achieve faster cutting speeds. In addition, the consumption of oxygen is much lower in these applications than the consumption of compressed air or nitrogen, thus reducing costs. Regardless of material type and thickness, the laser cutting operation begins with a piercing process that governs the overall cut quality. In other words, if the pierce is clean, the stage has been set for a clean cut. However, if the pierce is poor or incomplete, there is significant opportunity for cut quality to be poor or, in some cases, for the cut to fail. 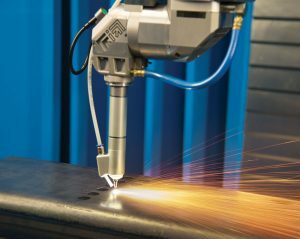 Prima Power Laserdyne cutting tests carried out using a 20 kW QCW fiber laser and oxygen assist gas revealed that cut quality was acceptable in terms of dross, taper and cut speed. However, piercing with oxygen proved to be very difficult and unsuitable for this application because faster pierce times and spatter free pierces were required. Repeatable oxygen pierces were possible using low peak power. However, the pierce time of 0.8 seconds for 7.5 mm thickness steel plate was far too high. Furthermore, the spatter that accumulated at low gas pressure required the process to be stopped and nozzle to be cleaned after only 15 pierces. Prima Power Laserdyne’s dual gas process using compressed air for piercing and oxygen for cutting provided consistent quality. Once it was decided to develop a better process using the two gases – compressed air for piercing and oxygen for cutting – optimizing the piercing process ensured 100 percent reliability while minimizing piercing time. With the high power QCW fiber laser as the source, LASERDYNE SmartPierce process was applied. (SmartPierce is a technique that involves pulse-by-pulse changes in any or all of peak power, pulse width, and pulse frequency. Direct control of the laser with the LASERDYNE control provides this capability.) Using SmartPierce, cycle time to provide consistent pierces in 7.5 mm steel plate using compressed air was reduced to just 0.4 seconds. The most robust process involving oxygen assist cutting uses high pressure compressed air for piercing and low pressure oxygen for cutting. Changing between gases within a process is relatively common, even in aerospace applications. However, piercing with compressed air requires purging the nozzle before introducing the oxygen. To purge the assist gas delivery lines, which is required for consistent cutting, a dwell time of two seconds (minimum) was required. With modification to the assist gas hardware, the changeover dwell time between the two assist gases was reduced to 0.7 seconds. While this may not seem like a major time savings, the total time savings is quite significant and can add up to hours per day when multiplied by hundreds of cut features required in multiple automotive components. Prima Power Laserdyne’s patent pending Dual Gas Delivery Nozzle ensures accurate and consistent flow of both compressed air and oxygen. With this nozzle, the time to changeover between gases is eliminated. Those familiar with laser cutting understand that laser system nozzle design is key to the overall process of piercing and cutting. Nozzle design can influence cut quality, protect optics, affect cycle time, and regulate gas consumption cost. To achieve the stated goals by minimizing changeover time between the two assist gases (compressed air and oxygen), Prima Power Laserdyne developed and tested extensively its new Dual Gas Delivery Cutting Nozzle. The nozzle is designed to deliver both coaxial and directional non-coaxial assist gas for piercing thick steel sections followed by fast laser cutting of the material. The directional non-coaxial gas provides the assist gas for piercing while protecting the laser optics and nozzle assembly during piercing. The coaxial gas is used for the cutting process. By utilizing both gases, piercing occurs quickly and cleanly through the thick sections. Furthermore, the need to purge gases when transitioning from piercing to cutting is eliminated. A comparison of cycle times for the three processes evaluated for this article is shown in Table One. Influence of laser and assist gas parameters on cycle times for piercing and cutting 7.5mm thick low carbon steel. The impact of faster piercing on the overall cycle time depends somewhat upon the size of the feature. The impact of the faster piercing is greater for smaller features than for larger features (Table Two). Nevertheless, the reduction in cycle time from combining SmartPierce and the dual gas nozzle is consistently in the double-digit percentages. Influence of laser and assist gas parameters on cycle times for piercing and cutting 9 to 42 mm diameter holes in 7.5mm thick low carbon steel. The BeamDirector positions a secondary measurement laser beam to various locations of the actual part surface to determine its actual shape. The results of this routine ensure that laser cut features meet tolerance requirements. 3D Mapping with large (up to 100 mm) standoff is made possible using Prima Power Laserdyne’s SmartSense feature. SmartSense uses a precision laser-based measurement device and software for adjusting the plane of a part surface to compensate for irregularities in the surface. The final innovation in this new laser process was to create a routine for mapping selected surfaces of the actual 3D blank to adjust for its imperfect shape before piercing and cutting the various features. This mapping process was required to meet the feature location tolerances for the part. The Prima Power Laserdyne answer is SmartSense™, the laser based, non-contact measurement tool that operates coaxial with the cutting laser beam and software. It collects and analyzes measurement data from the surface. The mapping results are used to adjust the planes of processing to reflect the real part location and shape in order to achieve laser processed feature precision. The SmartSense technique provides proper location of holes and other cut features within the component despite less than perfect shape of the blank. This original story and images were authored by Prima Power Laserdyne and not for republication.